Thanks, Milwaukee! We're one, and we want to celebrate with you! It's been an amazing first year! We started with a simple vision: building a space where people of all ages could play together (and where adults would have a good time, too). When we (finally) opened our doors to the public in May of 2014, we were blown away by the level of excitement and community support. In our first year, we've been proud to help celebrate hundreds of child and adult birthday parties (and have gotten hundreds of hugs and high-fives!). Surprise parties have been a hit, along with family reunions, bachelor and bachelorette parties during our 21+ hours - even some Passover celebrations. We've hosted both field trips and team-building experiences for many of our favorite schools, scout troops, Boys and Girls Clubs and the Salvation Army. The word has gotten out that we're not just for kids, too. We've been a venue for special events from groundbreaking organizations such as Yelp, Newaukee, Magnetag, the Brew City Bruisers and Blitzdkrieg. 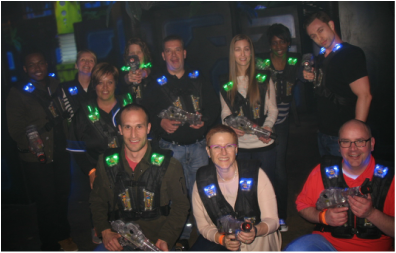 Many of Milwaukee's best and trusted brands have trusted us for their staff team-building, including Classic Slice, ComedySportz, Comet Cafe, Connecting Bridges, Northwestern Mutual, Potowatomi Bingo and Casino, and Rockwell Automation. And we're proud to have hosted fundraisers for Extra Life, Children's Hospital of Wisconsin, Playworks, Local First Milwaukee, Hope House, Scouting troops, many amazing schools (and even a few political campaigns!). Our first New Year's Eve celebration sold out, and many couples found new love or rekindled their romance here on Valentine's Day. From all of us here, thanks for being part of this. We'd like to thank you by buying everyone in Milwaukee a drink. As that might be problematic, though. 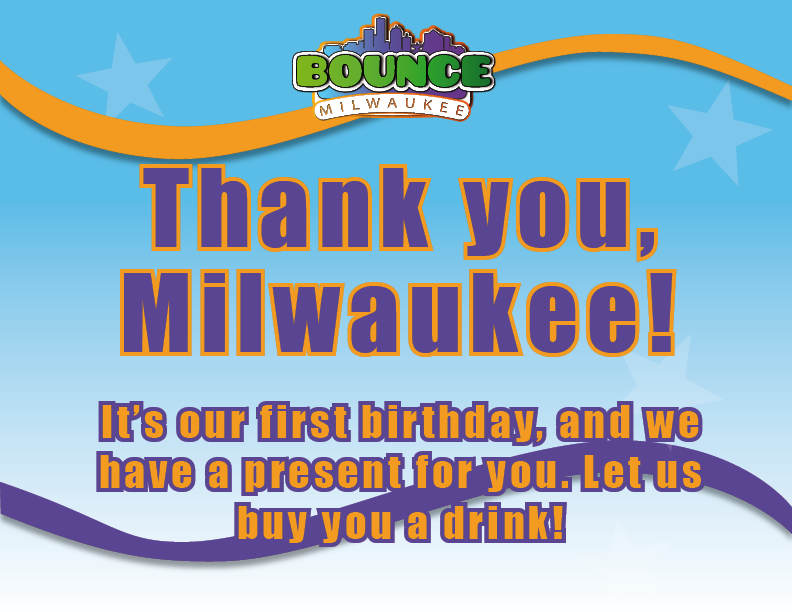 (as this is Milwaukee, after all), we're instead buying just our loyal customers a drink. "But how do you know I'm a customer?" you ask. Remember that fun waiver you filled out during your first visit? We can look it up! If you've been here before May 15th, 2015, come in any time between now and May 31st, 2015, and we'll look you up and give you a drink ticket good for any drink - hard or soft - up to $7 (which covers pretty much everything except our high-end champagne). It's one per person. Kids get one, too, though you'll of course need to be 21 for alcohol. You don't need to purchase anything (though you're welcome to stay and play). We just want to thank you for an awesome first year - hopefully the first of many to come. New Year's Eve at Bounce Milwaukee!